There he is, number 25780, the natural runner of the family. This was his second half marathon in 3 weeks. Three weeks ago he ran in Haarlem with a time of 1:45. Three weeks later he ran in Amsterdam with a time of 1:43. He was SURE his Amsterdam time would be slower than Haarlem. I had more belief in him than he did! 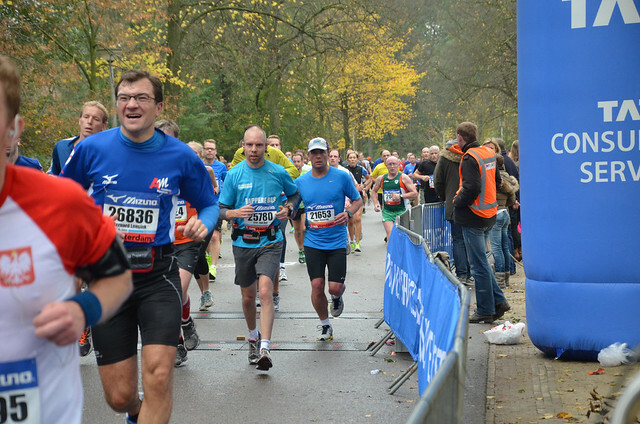 The Amsterdam marathon began at 9:30am. The half marathon began at 1:30pm. The slowest of the marathon runners were still running when the half marathoners started coming in to the finish. 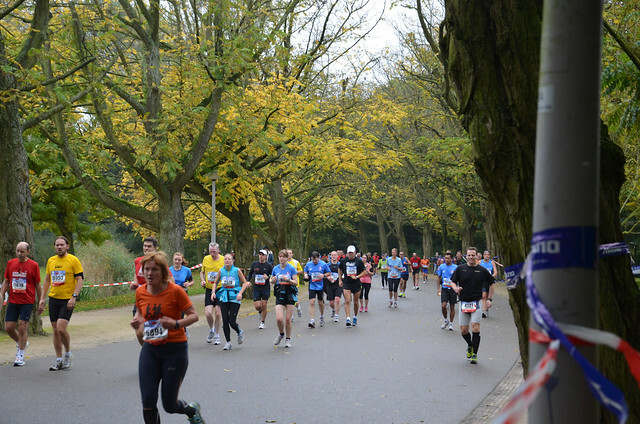 The photo below was taken in the Vondelpark, 4.5 hours after these people had started running. Let me say it again. They had been running for nearly 5 hours when they got to the park. They still had 3km to go. Respect. DB was so enthusiastic after this race that he signed up for Egmond that same evening. And I must admit that seeing all these people running (15,000 of them just for the half marathon) made me pretty enthusiastic too. I signed up for the Egmond 10k. It’s in January. I have time to get ready. Yes, January. In the cold. On the beach. Yes, we are crazy.